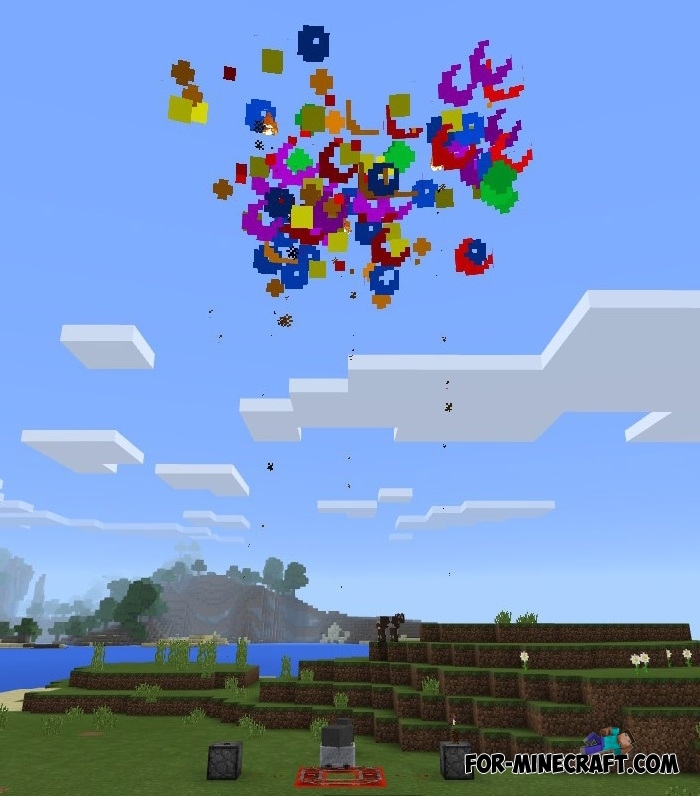 Fireworks addon contains 5 colorful fireworks that will decorate the sky in Minecraft PE 1.0 (0.17.0). Just imagine, you have built a house in a snow biome and do not know what to do. To diversify the boring days, you need to launch a few fireworks and the sky will shine with beautiful colors. We recommend to use fireworks in the night, in which case you will see all the colors and beauty of the explosion. New types of fireworks and a way to get (read below). Sounds of explosion and launch (requires Minecraft PE 1.0.4.1 and later). You can use it together with redstone mechanisms and command blocks. Fireworks merchant who gives out fireworks for free. Some fireworks are made in the form of a block and require installation on the ground. How to get the fireworks? Rockets replace fireballs, so collect as many as possible. Use creative inventory to instantly get the fireworks. In the second version you need to get fireworks from villagers (just find a village). Approach any character and click the button. All fireworks are free and drop out instantly. How to use the fireworks? You will need a special platform for launching rockets. The easiest way is to use a dispenser. Put the rockets into dispenser and activate it (be creative, create different mechanisms). Once the dispenser receives a signal, the rocket will fly in the sky and you will see this beautiful picture. Call a friend and arrange snowballs battle, you'll like it. How to install the Fireworks addon? Activate the "Fireworks 2.mcpack" and any of the seven colors.